Park the vehicle on a level surface, and set the parking brake. 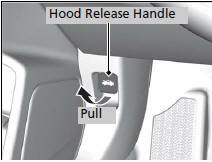 Pull the hood release handle under the driver's side lower left corner of the dashboard. ► The hood will pop up slightly. Pull up the hood latch lever (located under the front edge of the hood to the center) and raise the hood. Once you have raised the hood slightly, you can release the lever. Remove the support rod from the clamp ►sing the grip. 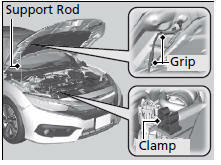 Mount the support rod in the hood. 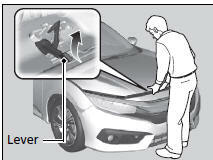 NOTICE Do not open the hood when the wiper arms are raised.